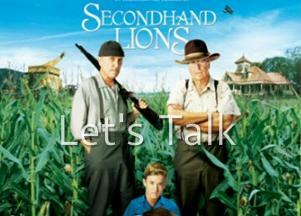 An observation in the movie "Second Hand Lions" Message of Suicide! I see this movie as doing a excellent job of hiding it's message in plain sight. The viewer is distracted by the entertainment and the "bad mother" and "bad sheik". And I believe the word "suicide" never is mentioned. tony: Have you seen the movie Second Hand Lions? tony: What did you think of it? JD: Well. er, um, it had some things I liked. tony: Did you catch the message? tony: What was portrayed as bad in the movie? JD: A few things I guess...as parents, we monitor a movie scene by scene...there was glorifying of violence, the fight scenes you know. tony:Most adults I've asked said it was Walter's mother. But a child I asked said it was that the two men killed themselves at the end. And he was RIGHT. The movie is about SUICIDE. tony: Yes. Think about the scenes. (Described below) Notice how at the end the sheriff calls, and they are in agreement about how preferable their death was? And also no one is sad and morning their death. Why? Was there no one who cared if these two healthy men lived or died? Did they go to heaven? Also the scene about Jasmine intending to kill herself rather than marry the 'bad' sheik. I myself was suckered for this suicide. I think this sets viewers up to think that the uncles' means of death was acceptable. JD: You're right, and that airplane scene is also at the beginning of the movie, for emphasis I guess. tony: No it's not to emphasize, it's so you know the death of the uncles, and the rest of the movie is for you to think it was a good death. If you watch the movie again, with this in mind, you'll see it very clearly. James went home, took notes, and here they are. He now sees the same message clearly and agrees with me in my asessment. Read the notes yourself, see the hidden message. The numbers denote the time that the comment occurs. Jasmine has been promised by her father. Notice how at 1hr:36m:53, a self murder is described as a blessing: "It's a blessing they did not suffer". Well, Knowing there is life hereafter I hope these small blessings are worth the effort for eternity. I do believe that God is willing to forgive murder, but with self murder there is no time to repent being you are now dead, and now having to face the judgement. I'm convinced that the adversary doesn't drone on with a long lecture, but rather, will use an entertaining song, movie, or other medium to deliver a single message.